We mountaineers love Alaska for its wild places. Many of Alaska’s mountains have no signs or history of human presence. This opportunity to explore an otherwise tapped-out planet is the essence of mountaineering. One reminder that you're not the first person to visit a new place is finding a cairn. A cairn is a man-made pile of stones—from a single balanced rock to a heap of stones—used by mountaineers to mark a route or a summit. Cairn-building has a long history. Native Americans in the Arctic used cairns, called inuksuits, to mark routes. On popular mountain trails, such as in the White Mountains of New Hampshire, cairns keep thousands of recreational hikers on route. Climbers follow cairned routes to difficult-to-find climbs. Most agree that cairns can serve safety or environmental purposes. They can mark, for example, tricky junctions, especially those used by climbers. A cairn can mark a hidden descent gully from a climb or a hard-to-spot access trail, such as the faint access trails to climbs along Eagle River above the Nature Center. Cairns can help keep everyone on the same route in fragile alpine tundra or in recently de-glaciated areas where plants are just emerging. This minimizes overall impact. The Football Field above Anchorage and the toe of the Spencer Glacier are places with well-applied cairns. Some believe that cairns are an important mountaineering tradition on mountain-tops. Summit cairns are often accompanied by a summit register. Advocates for summit cairns say that it’s important, for historical purposes, to know if someone has been there before. In remote mountain regions of Alaska, cairns are often the only sign of humans. Perhaps the most basic argument for cairns is that they are simply piles of stones. They are fun to make and do not pose a significant environmental issue. Why Do We Really Build Cairns? It’s easy to understand why humans build cairns for safety or environmental reasons. The art and zen of balanced stones in nature is also attractive. The real reason mountaineers build cairns is less easily understood. Men feel compelled to leave their mark wherever they go. By this I don’t mean castles and ramparts, ruined buildings and ancient walls. Instead, I mean the small marks that individuals make to ensure that their passing has been noted. Another reason some people build cairns is to feel in better control of the terrain. They may be out of their element and believe that cairns are essential for them and others after them to navigate the route. In Alaska, where few routes are clearly visible, their navigation skills with map, compass, altimeter and GPS may not be equal to the terrain they’re traversing. Such cairns are akin to chipped holds that make a rock climb more attainable. Mountaineers in general have a strong Leave No Trace ethic. Leaving trash in the mountains ended 50 years ago, but many mountaineers do not view cairns as leaving a trace, perhaps because the cairn-building tradition is also strong among U.S. mountaineers. The fact is, however, if you build a cairn, you are leaving a trace. 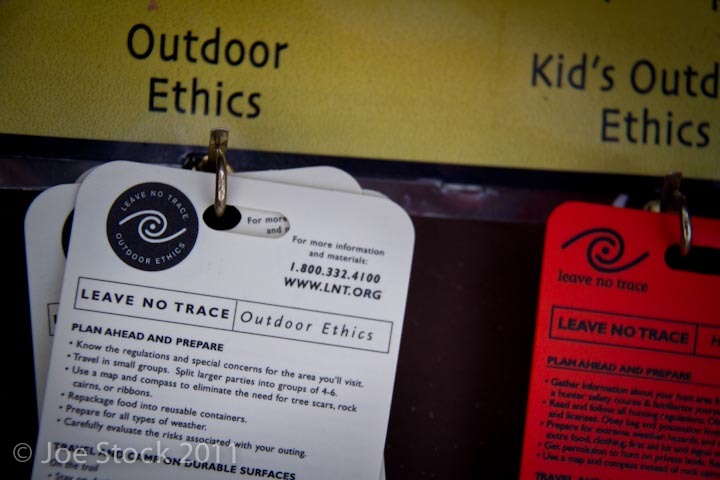 This concept is a part of Leave No Trace's seven principles: "Use a map and compass to eliminate the use of marking paint, rock cairns or flagging." Many mountaineers live in Alaska for that feeling of exploration—a sense that we may be the first person to visit a place. In Alaska, standing on a pristine summit with no history and no sign of humans is still possible. It's a powerful feeling. Some strive to give everyone that feeling. Others strive to let people know they’ve had that feeling. One of the greatest aspects of our pursuit is that any route can feel unclimbed if previous ascensionists leave no sight of their passage...Climb with minimal trace, and those who follow your vision might still receive the gift of newness. In Alpinist 35, Fairbanks climber Jeff Apple Benowitz tells the story of Alaska vanity plate 10901. The car’s owner first-ascended Peak 10,910 in the 1970’s, but didn’t report it so others could enjoy the same adventure. Cairns are justified in a few places for safety or environmental reasons. For example: 1) Tricky turns—A small, three-stone cairn can mark a hidden descent gully from a climb, or a hard-to-spot access trail. 2) Fragile alpine—Such as a recently de-glaciated area in the Alaska Range. Also, in heavily used areas, such as The Football Field below O'Malley Peak above Anchorage, cairns that keep everyone on the same route can minimize overall impact. In these cases cases, a smaller cairn of, say, three softball-sized stones would serve the purpose as well as a bigger cairn. But why not apply Leave No Trace to less-frequented routes and summits? Let’s stop building cairns in these places or, further, dismantle ones that serve no useful purpose? Return the stones to their natural positions, lichen-side up. If you feel you must leave your mark, do it on the internet or in publications such as the American Alpine Journal or Scree. Within LNT's seven principles is Plan Ahead and Prepare: "Use a map and compass to eliminate the use of marking paint, rock cairns or flagging." Opinion: It’s Time to End Cairn Building, by Robyn Martin, Adventure Journal. High Route Redux, Steve Roper, Backpacker, 1997. Going Where A Lot of Other Dudes With Really Great Equipment Have Gone Before, John Tierney, New York Times, 1998.